In my blog of 6/28/15 I discussed the Paisley motif. 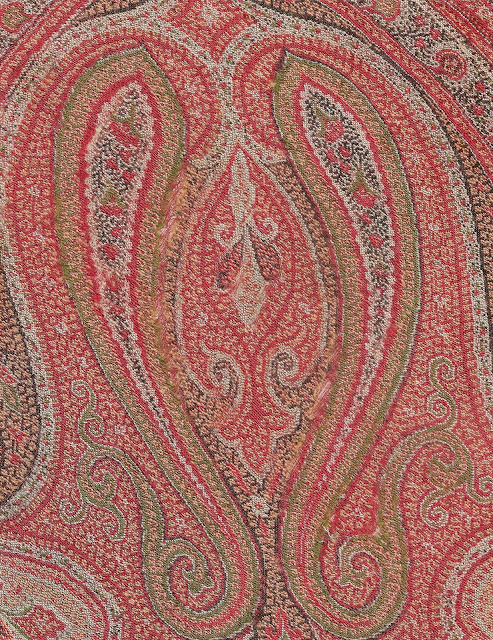 The most common association with this Indian motif is the Paisley Shawl, a much sought-after fashion accessory of the 18th and 19th Centuries. Although the term “shawl” today refers to a rectangular or square of cloth worn as a wrap around the shoulders or head, the word is derived from “shal”, Persian for any finely woven cloth. For centuries the finest woven shawls came from Kasmiri, north of India in the Himalayas. The wool fibers, which we refer to as “cashmere” are more correctly called “pashmina” and come from the underbelly of mountain goats. Indian shawls were always handwoven in 2/2 twill tapestry weave on a horizontal loom, the technique known as “kanikar ". Colored wefts were inserted with small bobbins and, as in true tapestry weave, they did not extend from selvage to selvage but were confined to the actual pattern. European woven shawls used a continuous supplementary weft which floated over the reverse. 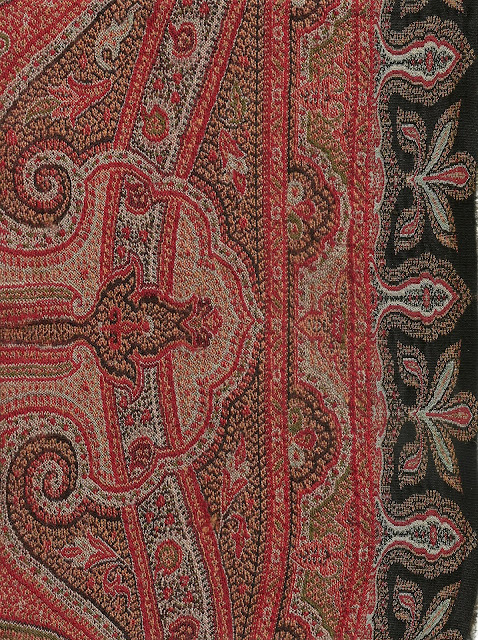 Produced as early as the 15th C Kasmiri shawls were introduced into the European market near the end of the 1700’s, however, they were extremely scarce and extremely expensive. Because of their popularity despite the cost, European textile manufacturers began to produce what were called “imitation Indians”. 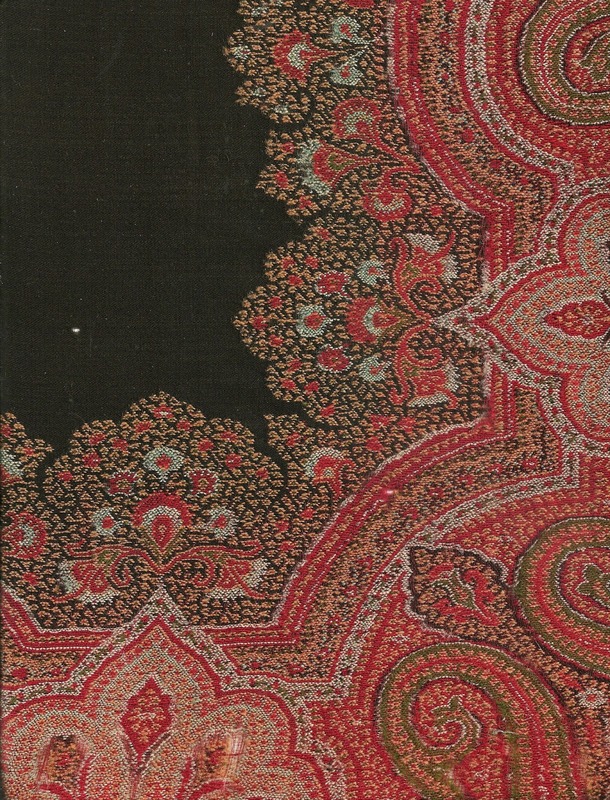 As it was not possible to import the fine pashmina wool ( their experiments with raising the actual mountain goats in Europe, a failure) they firstly wove the shawls in silk at Spitalfields using copies of the original Indian patterns. Other cities such as Edinburugh and Norwich soon followed. 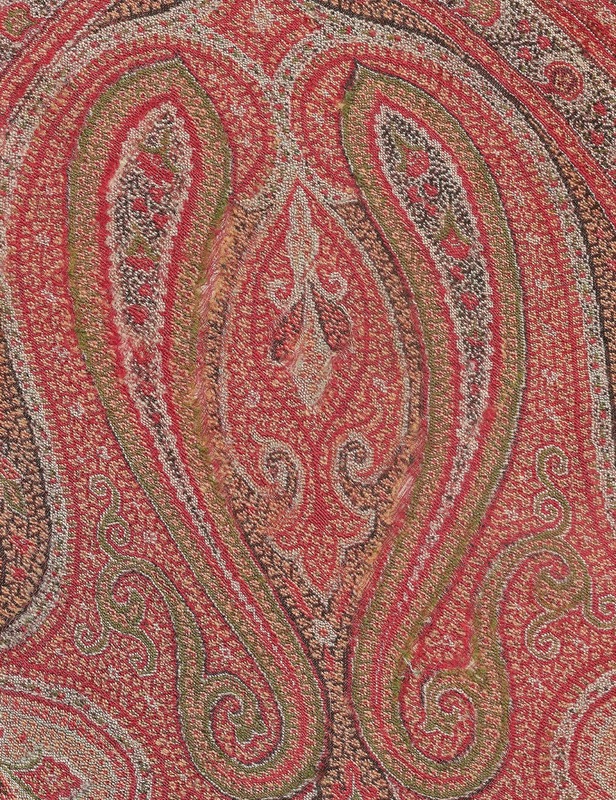 But it was Paisley, Scotland that lent its name to this textile. 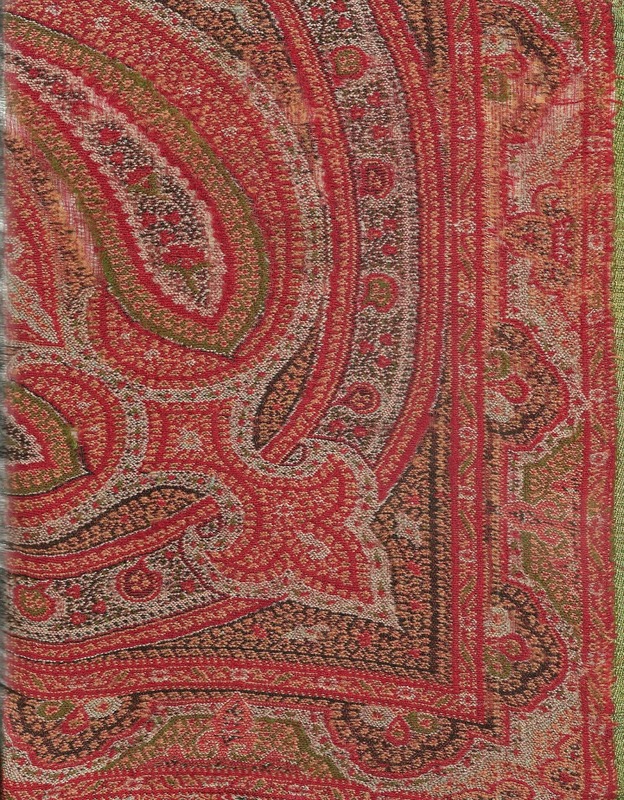 Because Paisley was a center for dyeing, printing and fringing, as well as weaving it soon became the major producer of the imitation Indian shawl. However, it was the French textile industry that had the most impact on the shawl production as well as other fabrics of intricate woven designs. In 1801, Joseph-Marie Jacquard developed a weaving loom, replacing the draw-loom. In short order the British began weaving copies of the French imitations. Woven shawls were replaced with printed ones. 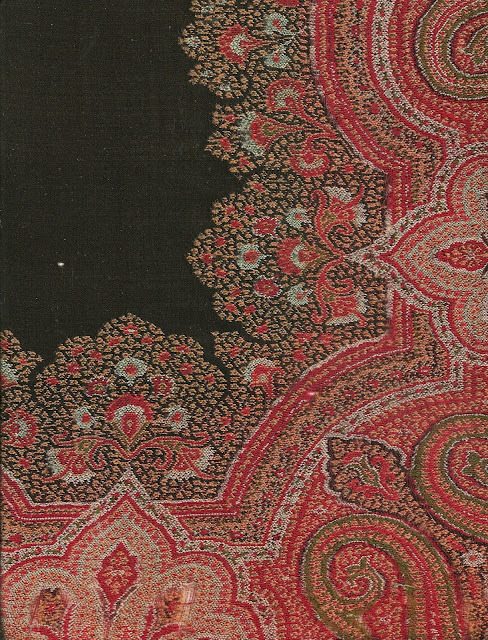 By the 19th C shawls were block printed on cotton or silk precisely imitating the original designs. By the end of the 19th C roller printing replaced block printing and lengths of paisley motif fabrics were produced. 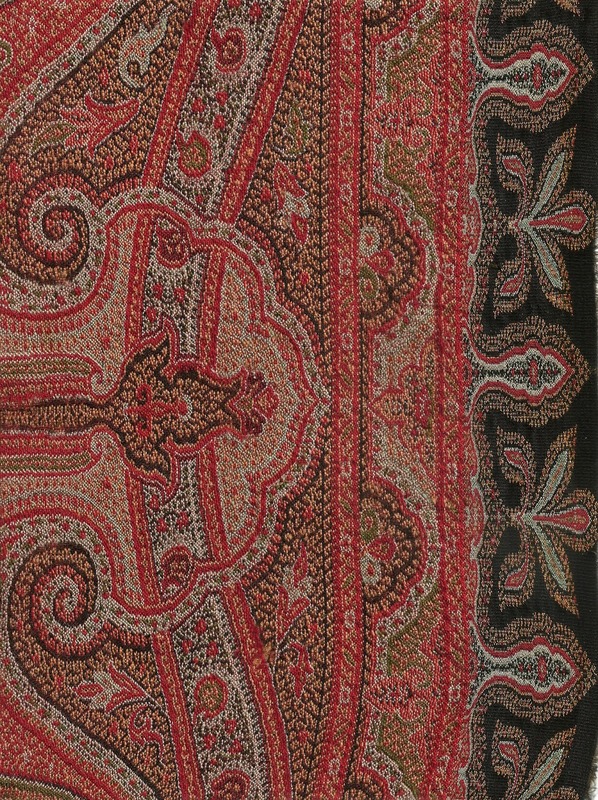 Section of a woven wool shawl. 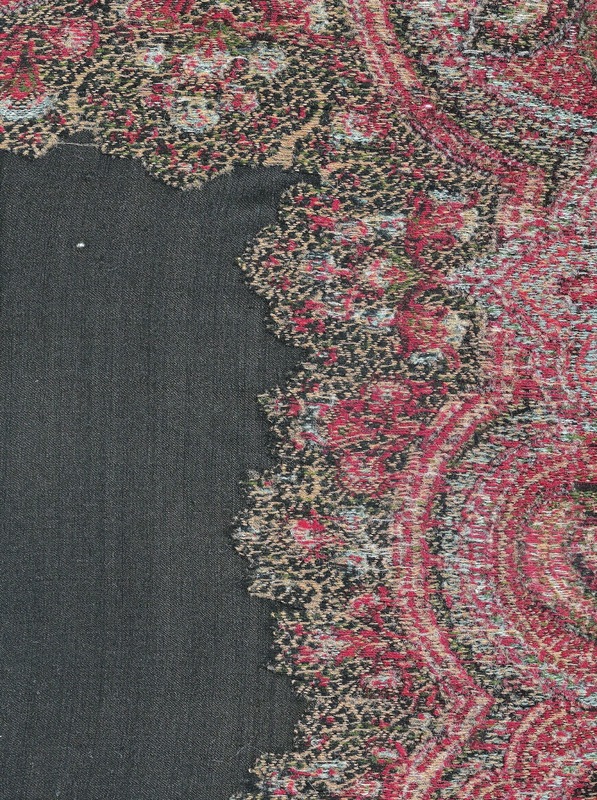 Note the black background which formed a very large square in the center of the textile. Fringe edge of shawl. The fine black fringe is entirely missing in this section. 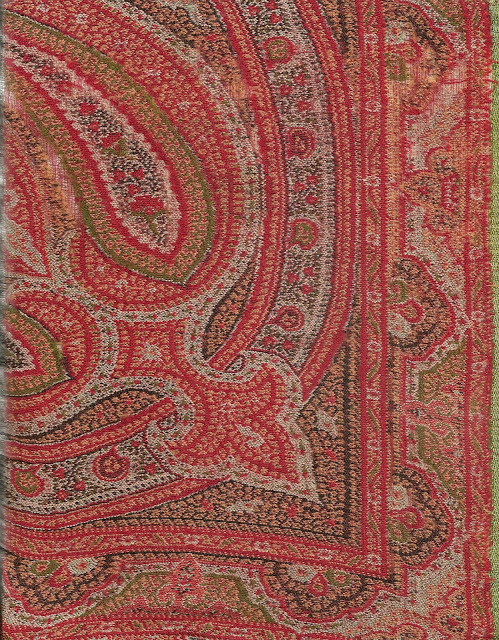 Woven paisley shawls may still be found, however, if they are in good condition they are pricey. 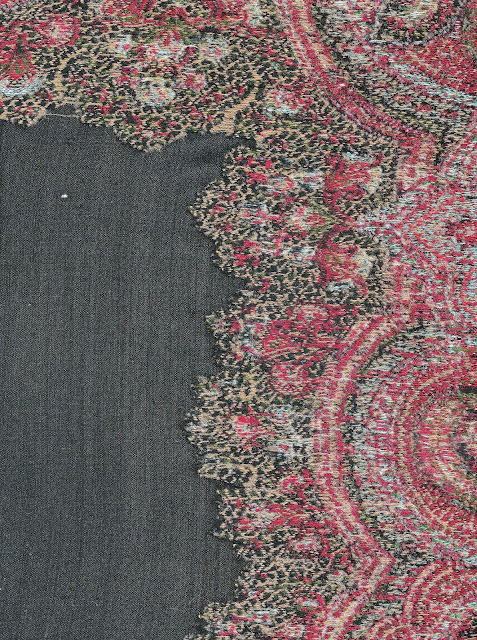 You may find these textiles in varying conditions and, depending upon the intended use, they may be repaired for table covers or sections may be salvaged for use as applique elements. Printed paisley is more affordable.